Sheilla and I left Lima at 1:00 Saturday morning. For some reason Lima is hard to get into and out of at a decent hour. We got back to Atlanta at about 8:30 and spent the rest of the morning and a good part of the afternoon wishing we could get into the hotel for a hot shower. The wait was worth it — it’s hard to appreciate a full and consistent spray of hot water cascading down your back until you’ve been without it for a week. This is true of so much that we take for granted in this truly blessed place we call home, things like cold milk, sidewalks and washing machines. Things went well in Peru. We got almost all of our assignments done and dedicated all ten houses on Friday afternoon. It was quite the event. The district mayor, a friend I’ve known since my first trip to Peru, was there along with a loquacious congressman and a brass band. We paraded through town, stopping at each house for a little ceremony — each family got their Bible and we gave each house a dedicatory prayer. They have an interesting but messy custom there of hanging a bottle of champagne over the door which is ceremoniously broken to inaugurate the house. And inundate the poor soul who has the honor of wielding the hammer. This was truly a work camp for the record books. We were a small band of volunteers — some 40 of us in all — but what a crew! Everyone worked hard, which is always the case, but everyone worked joyfully, as well. Zenon and his team did a remarkable job of getting things ready and keeping them moving. Hailey and Ryan from our office made sure that the volunteer logistics worked, and Frank Purvis and Bill Lifsey did an amazing job of keeping the construction timetable. The families we built with come from truly meager circumstances, and over and over I heard them say that this was a dream come true, a miracle. In addition to dedicating the houses we also dedicated Millard Fuller Boulevard, which runs along the canal that brings water to the area, and Richard Semmler Avenue, named for a true friend of the Fuller Center who has contributed greatly to our work both in Peru and in Haiti. Richard is a college professor who lives humbly and donates everything he can to work like ours — a true saint. One day, as Sheilla and I were making the climb to our house (which was set on a hillside about as far away from the others as possible while still being in town!) we were stopped by an elderly man who wanted us to visit his home. I don’t really know how old he and his wife are — anywhere from 60 to 80 — and they were a kind and gentle pair. They live in a one-room structure made of woven mats with dirt for a floor and a tarp for a roof. They told us how blessed they’d be if they just had a single room with a concrete floor and a solid roof. At one of the celebrations in town a woman came and sat next to me and asked for a moment of time. Her situation is the same as the elderly couple’s, and she repeated their plea, to simply have a safe and healthy room. These visits, coupled with my trip to Roma, were affecting. As we continued our hike up the mountain Sheilla asked why we can’t do something for these folks, just a simple room. There really isn’t any reason that we can’t. 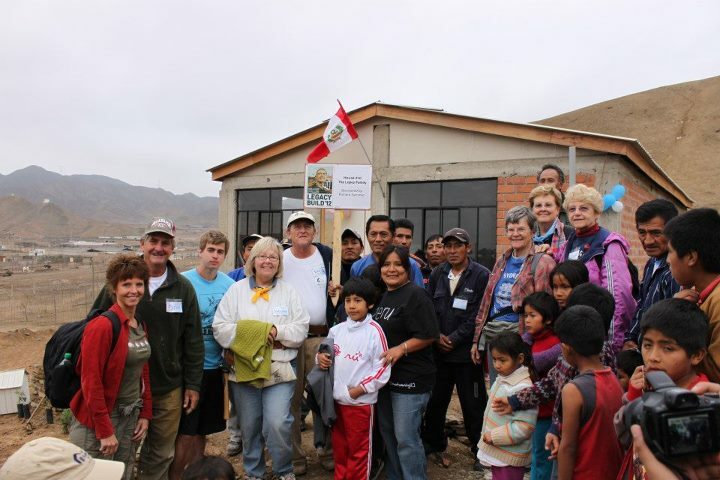 The houses that we build in Peru and with our partners around the world aren’t ostentatious, but they are, by local standards, quite nice, and we need to keep doing that because kids need a decent place to call home. But I’m wondering if we can’t come up with a separate program to help the poorest folks, a basic structure with a solid floor, pillars and a solid roof, a sort of international Greater Blessings program. We’re going to spend some time on this idea. Now we’re in McDonough. Registration starts in a couple of hours and then the kickoff dinner. I’ve already seen a number of old friends — these events are like family reunions. This week will be an entirely different experience from Peru in many ways, but just like it in the most important ones: people of good will coming together to do just what Jesus asked us to do — reach out to those in need and give them a hand. I can’t think of a better way to spend some time.